For the mousse, place the chocolate pieces and warm water in a large heatproof bowl and sit it over a pan of barely simmering water, making sure the bowl doesn't touch the water below. Keep the heat at its lowest setting and allow the chocolate to melt slowly. Remove from the heat and stir thoroughly until the chocolate is smooth and glossy. 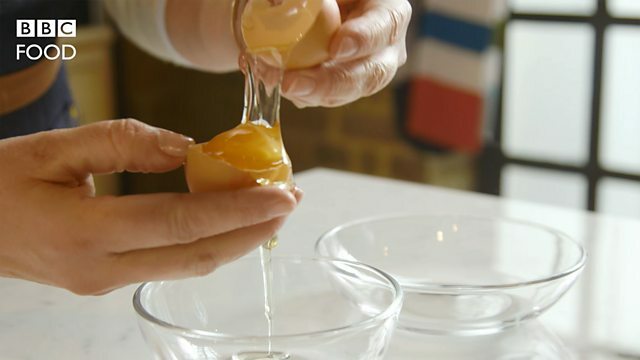 Let the mixture cool; then mix in the egg yolks thoroughly with a wooden spoon. 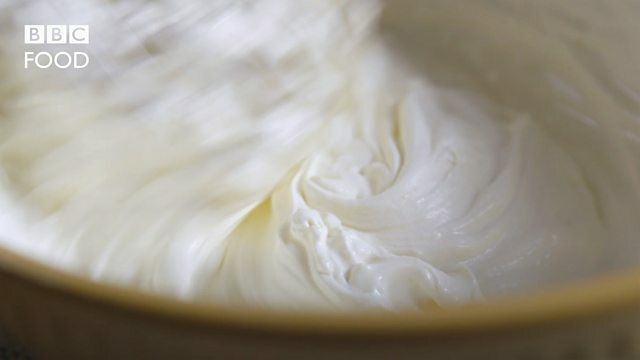 In a clean bowl, whisk the egg whites until soft peaks form when the whisk is removed from the bowl. Gradually whisk in the sugar and continue whisking until the whites are glossy. Using a metal spoon, fold the egg whites into the chocolate mixture, taking care not to knock the air out of the egg whites. Set aside in a cool place. For the tuile, you will need six small round biscuit cutters. Roll one of the cutters along its side onto a piece of thick card, one complete turn, to gauge its circumference. Cut a long thin rectangle the size of the cutter out of the card to leave a rectangular-shaped hole. Now cut a circle-shaped hole from the card (the same size as the cutter) from the centre of the cutter. Whisk the cocoa powder and water together to make a loose paste in a small bowl. Set aside. Place the butter and icing sugar into a separate bowl and beat until smooth, light and fluffy. Gradually add the egg whites to the mix, and then fold in the flour. Line a baking tray with a non-stick baking mat. Brush the cocoa paste over the mat to give a light coating. Set the remaining cocoa paste aside. Place the template on top of this and spread the tuile mix very thinly over the holes with a palette knife, then lift off the template, leaving two perfect shapes. Repeat to make six sets (or more if you have enough of the mixture). Bake in the oven for 4-5 minutes until lightly coloured around the edges. Remove from the oven and cool for one minute. To assemble the tuile boxes, flip the edge of one of the rectangular tuiles up, and using one of the cutters, roll the tuile around the outside of the cutter to create a cylinder. Repeat with the remaining cutters and tuile pieces. Leave to cool slightly; then remove the cutters to cool completely. Allow the round lids to cool flat. For the vanilla cream, place the cream, icing sugar and vanilla seeds into a bowl and whisk until soft peaks form when the whisk is removed from the bowl. To serve, brush a strip across the centre of each plate with the cocoa paste. Place the tuile cylinder in the centre of each and fill with the reserved chocolate mousse. Top with a few raspberries and place the tuile lid on at an angle to just cover. Spoon the vanilla cream alongside.